The U.S. Consumer Product Safety Commission (CPSC), in cooperation with Munire Furniture Inc today announced a voluntary recall of about 24,000 Majestic Curved Top and Flat Top Cribs, Essex Cribs, Brighton/Sussex Cribs and Captiva Cribs because the cribs fail to meet the federal safety standards for cribs. The four support brackets on the mattress support spring are too long. The brackets prevent the spring from lowering to the full 26 inch minimum height in its lowest position, allowing children inside to crawl over the railing, posing a fall hazard. The cribs are wooden. 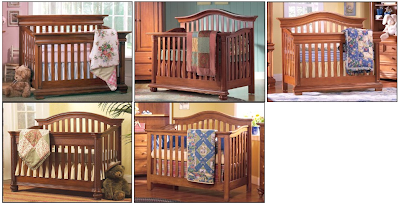 The recalled cribs include: Majestic Curved Top cribs with model number 9500; Majestic Flat Top cribs with model number 9000; Essex cribs with model number 7100; Brighton/Sussex cribs with model number 9100 and Captiva cribs with model number 5100. Only cribs with manufacture dates between November 1, 2005 and November 1, 2007 are included in the recall. The crib model number is printed on the white label on the bottom inside of the right side rail. The crib manufacture date is printed on either the white label near the model number or on the white label located on the bottom of the headboard. Cribs with a green sticker on the mattress frame are not included in the recall. Parents should stop using the recalled cribs and contact Munire Furniture at (866) 586-9639 or visit the firm’s Web site at www.munirefurniture.com to receive replacement spring brackets.